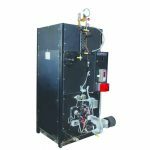 Pictured here is a Parker Boiler 9.5L-WW (Low NOx) water wall design 9.5HP, 150 PSI Steam Boiler. Parker Boiler has been conducting extensive testing on this new Vertical water wall design in 2015 and 2016. Standard Heavy Duty 1″ tubes are used with a 0.12″ wall thickness. The tubes are bent around the flame creating a water wall furnace. A large ½” thick seamless horizontal steam drum is used for a steady water line and clean dry steam production. Foot print similar to vertical tubeless boiler. The sealed combustion design raises efficiency with lower excess air and minimizes heat loss to the room. A low NOx metal fiber burner is standard for 20ppm and Pre-certified to AQMD 1146.2. Units will be available 9.5 HP to 24 HP. It also has up to 4″ of insulation, 5:1 Turn Down Ratio, Digital Pressure Control, Reflex Prismatic Sight Glass, 2 sides that do not require access, allowing it to be placed in the corner of a room. thus saving floor space.